Present Day Peter Pan; A Jellyfish (Turri-top-sis nu-trick-u-la) – EVA LA ESCRITORA – "Follow a Writer's Dream." Floating around our oceans is a small menace that can return itself to its infancy. These clear-bodied examples of floating poison are the only known immortal animal on the planet. 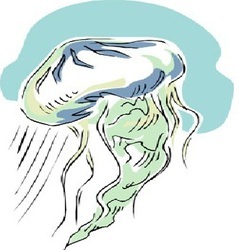 During adulthood an unknown event triggers a regeneration response in the jellyfish. Unlike other animals, like salamanders that regenerate a specific part of their bodies, Turritopsis nutricula returns itself to its polyp stage of development, reattaches to a piece of coral, etc. and starts life again. Generations of their offspring remain to grow, too. Unless killed by a predator, they keep living their lives over and over. Experts believe this repeat performance can happen indefinitely. Researchers know that the mechanism for the rejuvenation process is genetic, but the ultimate trigger for that process still stumps the experts. The increasing numbers of the jellyfish species alarm the world’s fishing industry. Researchers and environmentalists are as alarmed as fisherman. These jellies have few predators, which have dwindling numbers. The neuron-toxin carried in their tentacles works on most fish. These ordinary Caribbean jellyfish now live in ocean waters from the Artic to the Southern Ocean, and can also tolerate fresh water. Experts and fisherman fear that the world’s oceans might become this jelly’s Never Never Land. [Reference to a Peter Pan’s movie ]….Only time and research will provide the end to this tale. READING THIS, I WONDER IF SCIENTIFICS HAS USED THIS TO EXPLORE THE POSSIBILITY OF US AS HUMANS TO HAVE A RARE CHANCE AT REGENERATING OURSELVES BACK TO A MUCH YOUNGER STAGE AS THESE JELLYFISH CAN DO. HAVE WE FOUND THE SO CALLED “FOUNTAIN OF YOUTH”. WHAT IF WE EAT THE JELLYFISH? WILL THEIR YOUTH SECRET BE HIDDEN IN THEIR NEURO-TOXINS, AND WILL THAT HARM US OR MAYBE MAKE US YOUNG AND WHO KNOWS IMMORTALS TOO? JUST A THOUGHT, MY OWN UNEDUCATED RANDOM AND CRAZY HYPOTHESIS. Previous Post Pet Lovers. Are they obsessed with their “babies”? Next Post I Don’t Believe Everything I read….